Mian Mohsin Zia aka "MIAN---No Time for Love" is a brilliant, humble and dedicated author obsessed with writing great books. He is an internationally acclaimed and international award winning Pakistani author, marketing and self-publishing specialist. His books have been rated 4 and 5 stars on Amazon and other sales channels. He has set new trends worldwide in novel writing with his books. His books have been read and reviewed by Hollywood actors, actors from British film industry, Award winning and New York Times best-selling authors and professionals worldwide. Wrinkles by Mian Mohsin Zia is a story of a deeper kind of love, one that stands the test of time. Here the message is about the love that makes a family. Xavier, a young man, has a great love for his mother and God. This story is thought provoking. The mother-son relationship is endearing. It had me reflecting on the role of a mother and the significance of her role within the family. Xavier has the kind of mother who gives him unconditional love and he is grateful for her gift, yet he is pursuing another kind of love to fulfill his dreams. He falls in love with Anna, a woman who seems distant and unattainable. He only becomes more obsessed and persistent with gaining her love. In pursuit of his love, Xavier is supported by his best friend, Faisal. Xavier and Faisal share a one-of-a-kind friendship which adds value to the book and makes it even more special. All through the story, I was rooting for Xavier to find his love. The story unfolds as Xavier, his mother, and Anna will encounter yet another person who will need the power of unconditional love that only these three strong individuals can give. The book cover is striking and depicts the main character in the most important role in the story. Mian’s books relay a message to readers that makes them unforgettable. A bonus is the addition of poems that are reflective of the character’s feelings. Mian Mohsin Zia writes with a passion as he creates three-dimensional characters. You can’t help but feel as though they are your friends. The dialogue seems very real and at times I felt as though I was right there in the story. The events will pull at your heartstrings, evoking emotions as you are turning pages to see how this story will unfold. This is a smooth read as all the chapters blend well and clarity is evident within the story. Wrinkles is a very powerful book that everyone should read. 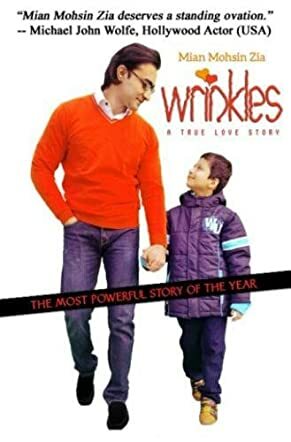 Wrinkles is a tender story of unconditional love that crosses generations and genders, cultures and creeds and removes the wrinkles from souls. Well-developed characters that carry beyond the pages from Cape Town, South Africa into readers’ hearts and reveal the wrinkles resident there. Zia is a voice for tolerance and change one person, and perhaps one wrinkle at a time. Once again the author takes a slice of a life lived by a strong, complex central character in a circle of relationships that makes him everyman (and everywoman by extension). He asks the hard questions of life and leads readers to sometimes surprising answers that hold TRUTH that teach and transcend without a hint of didacticism. I have enjoyed watching Zia’s writing career unfold from book to book. He is a strong voice of not only literary Pakistan but the literary world without pretension, heavy-handedness or wordiness. His writing is honed and deep while telling a simple story in simple words that is not simplistic and lingers long after the final page is read.